This Christmas, it’s time to get creative with your wrapping. Regular old paper wrapping can be quite pretty and is no doubt fun to tear off a big old box, but why not spice it up a bit? You might even be able to regift some of those Christmas items you’ve never used on top of giving the fabulous gift you purchased. A bottle of wine or champagne is a staple gift for a hostess at the holidays or any time of year. This year, ditch the curly ribbon or the brown paper bag it came it and cozy up the bottle with a Christmas sock. 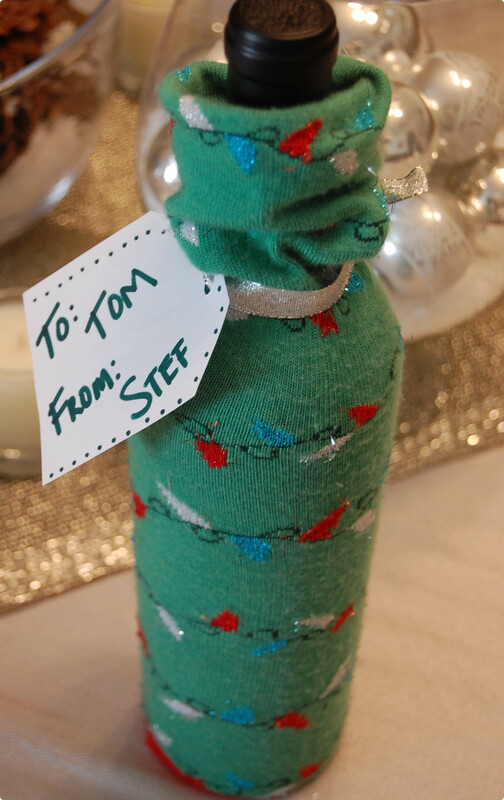 Simply slip the wine bottle inside of a holiday sock and use craft ribbon to secure a tag in place around the neck of the bottle. Feel free to bring the extra sock along, or double it up, to give to the hostess the matching pair. *Used socks need not apply. 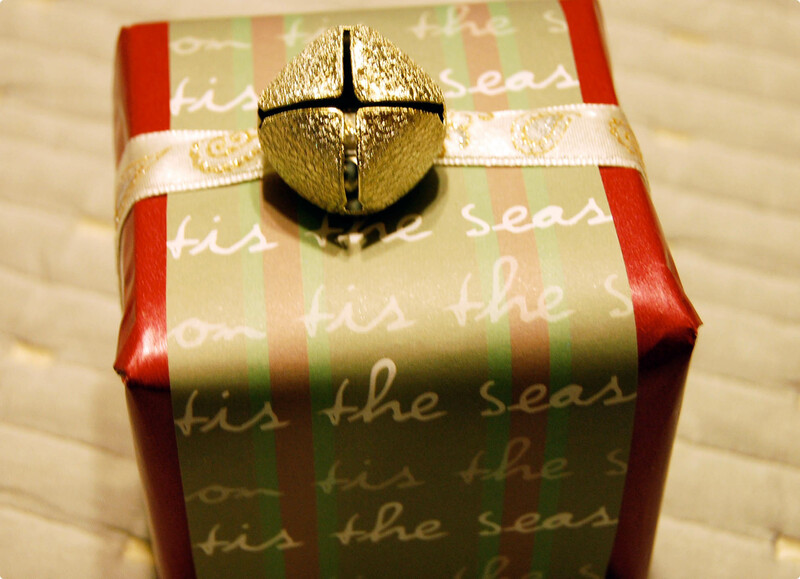 Have a smaller box or oddly shaped gift to wrap? Use a holiday tea towel or dish towel for a unique unveiling experience. 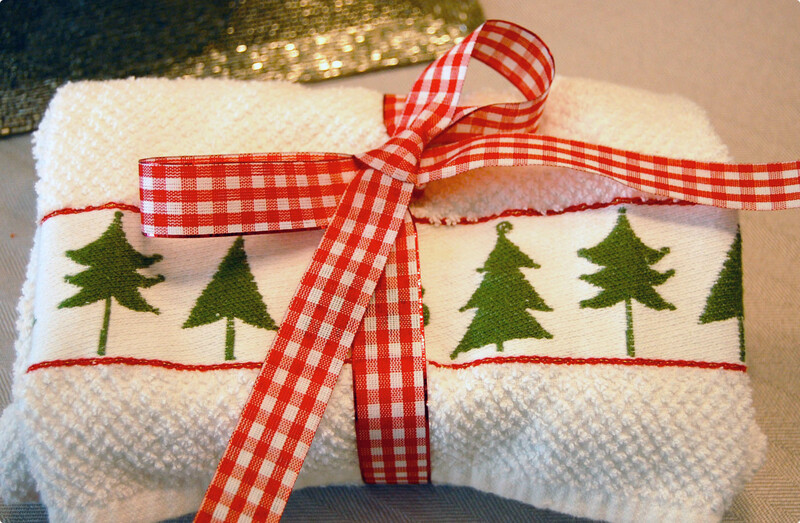 Just wrap the gift and either knot the towel or use craft ribbon to keep it from unfolding. It is a bonus two gift in one! If traditional wrapping paper is more your thing, there are lots of tricks you can use to mix it up a bit. This year I decided to buy all solid color wrapping and accessorize with ribbons and other extras. I love scrapbook paper. It is pretty, cheap, and adds color and patterns in a no fuss kind of way. 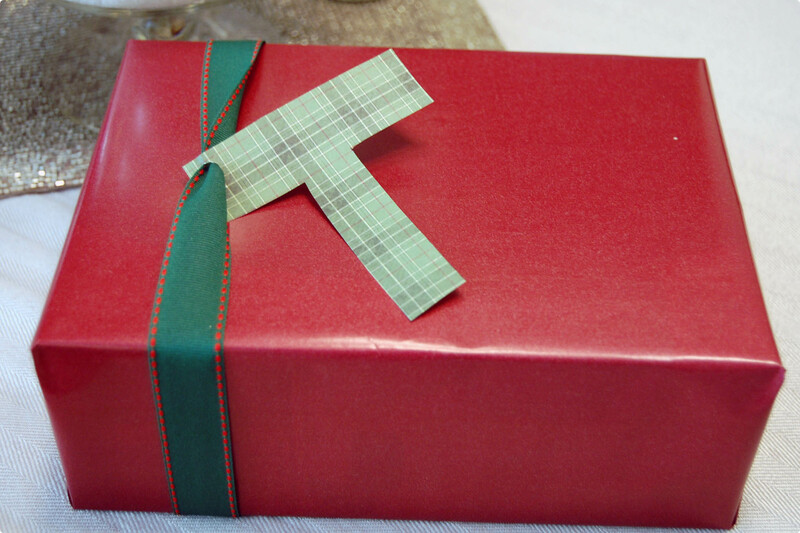 Using holiday scrapbook paper, add an extra piece of paper around the middle of the box to give it some dimension. Using sparkly ribbon, tie a little something extra on the top like a jingle bell or an ornament. If you have horrible handwriting like I do, I do everything I can to skirt around writing tags. Try cutting scrapbook paper into the recipients initial and tying it on with a ribbon. You can also print homemade tags on the computer. And last but not least, if you are saving stamps this Christmas and not sending out a Christmas card, why not make and print a few on your printer at home and attach them to the top of your gift? There is nothing wrong with regular wrapping paper and a sticky bow (most likely I will have a few of those too)! But it makes the chore of wrapping gifts a little more fun when you throw some creativity into it. What do you to do spice up your gifts? I make custom wrapping paper at Giftskins.com! Hi there – I love the sock idea! I’ve seen wine ‘wraps’ made with sweater sleeves, but I love how do-able and accessible this is. Thanks for sharing! 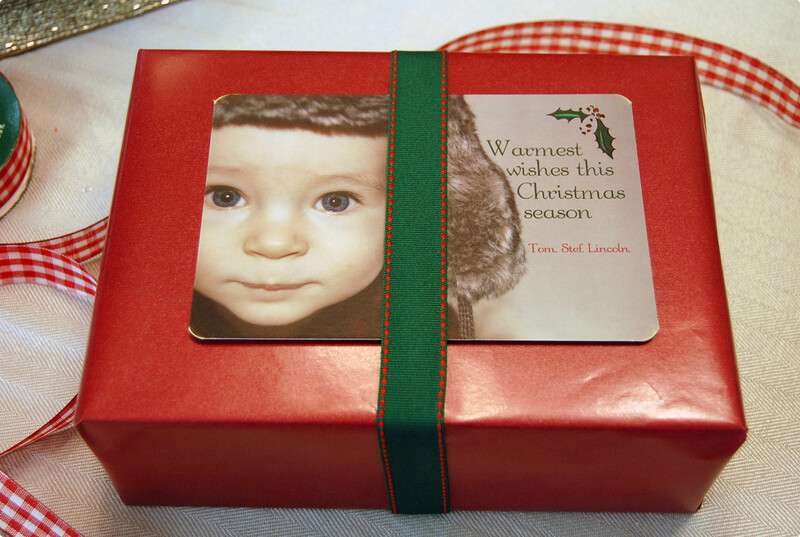 Now who WOULDN’T ADORE a gift with a picture of my cutie godson’s face on it?! What a cute idea, sister! It’s funny that this was your post today as I did something a little different with my gifts this year. It always bugs me that I spend so much time on bows only to have them smooshed en route. This year I opted to make oversized name tags for each gift and just tape them right on to the box…… I guess you’ll be able to see in a few days! Great post! My sister in law makes fabric gift bags for all gifts. She just buys holiday fabric at someplace like JoAnn’s…which is usually on sale this time of year. Then sew up the sides and you have 2 gifts in one. We just keep passing the bags around the family year to year. Saves on paper, tape etc. Usually just have some ribbon on hand to tie them off. 1. Since we’re traveling, we wrapped fun yarn around our gifts rather than ribbon..